WILLEMSTAD – “The people are not interested in all those technical stories, but want to know when you can guarantee the electricity supply and when you will reimburse the damages appliances and the spoiled food,” said the MAN faction leader in Parliament, Elsa Rozendal during the parliamentary meeting with the utility company Aqualectra. 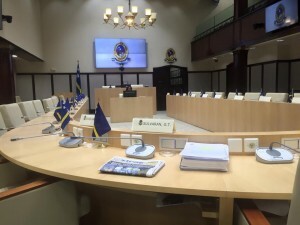 The Members of Parliament were not really happy yesterday with the presentation given by the representatives of the utility company and the public company Curaçao Oil Refinery (RdK)/Curaçao Refinery Utilities (CRU). The general opinion of the MPs was that Aqualectra’s presentation was too technical. “Each time the same story!” The presentation was given by the interim plant manager of the RdK/CRU Henny Barbolina and Aqualectra’s CEO Darick Jonis. The PAR faction indicated that the people are really fed up. The word “switch” is, according to Marilyn Alcalla-Walle, “non grata”. “We don’t want to hear it anymore. Every time you come with excuses. It’s too hot in Curaçao, there is not enough wind, etc. etc. These are all excuses,” said the PAR faction leader during her intervention. Stephen Walroud, also a PAR MP, proposed a temporary parliamentary committee concerning energy policy. This proposal was accepted by other coalition members. Other MPs asked the Aqualectra delegation when the people will get reliable and affordable electricity. The Minister in charge of the energy sector, Minister Kenneth Gijsbertha received 150 questions from parliament which will have to be answered in two weeks.